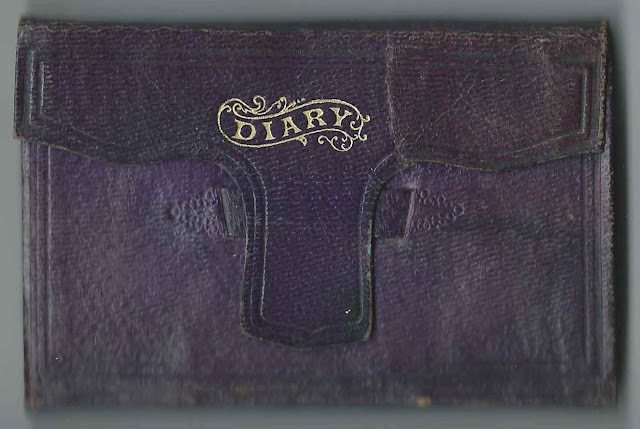 January entries in the 1873 diary of Ida Isadore Reynolds (1860-1946) of Acton, Maine. Ida would marry John Jotham Shapleigh (1856-1923) in 1881. A link to a post featuring entries from February 1873 appears here and at the end of this post. In 1881 Ida would marry John Jotham Shapleigh (1856-1923), a native of Lebanon, Maine. After the death of their son Ernest in 1882, they moved to Rochester, New Hampshire, where they had a daughter Doris, born in 1898. Wednesday, January 1, 1873: Fair. Father went to the Corner. I went to Enoch's. Hattie here in Evening. James Applebee, teacher. Thursday, January 2, 1873: Cold and Dry. Worked on vests. Went to Mrs. Bell G. Prescott. Father went to Mr. Hilton. Got a letter from Addie Moor. 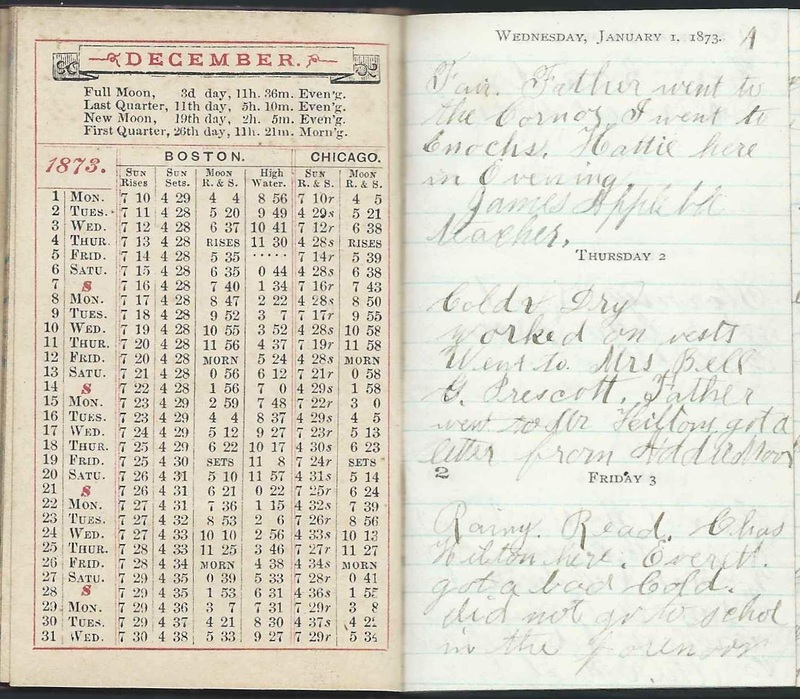 Friday, January 3, 1873: Rainy. Read. Charles Hilton here. Everett got a bad cold. Did not go to School in the forenoon. Saturday, January 4, 1873: Fair. Baked. Father went to Mr. H's. Tuesday, January 7, 1873: Fair. Went Sliding. Edward went off. Hattie Here. Went to Hattie's. Wednesday, January 8, 1873: Fair. Father & Mother went to Great Falls [presumably Somersworth, New Hampshire]. Got Me a dress, crochet needles. Almon sent me some candy & some blue ribbon. 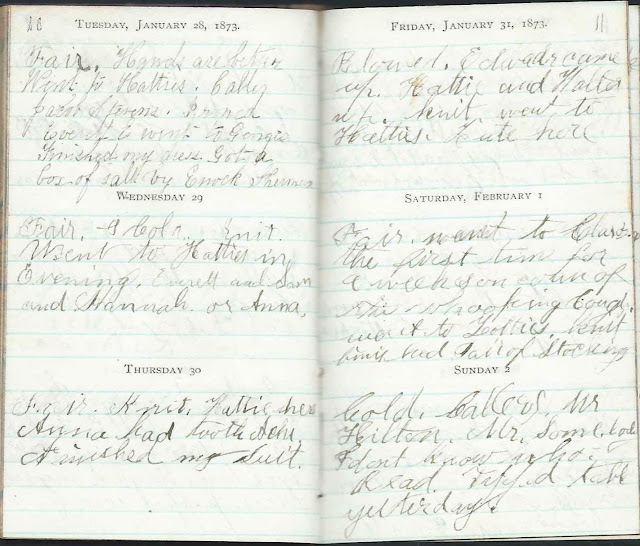 Thursday, January 9, 1873: Fair & Icy. Rained in night. I went to Mr. Hilton's. Sammy went up all day. Hattie here. Sammy cut his wrist Monday. 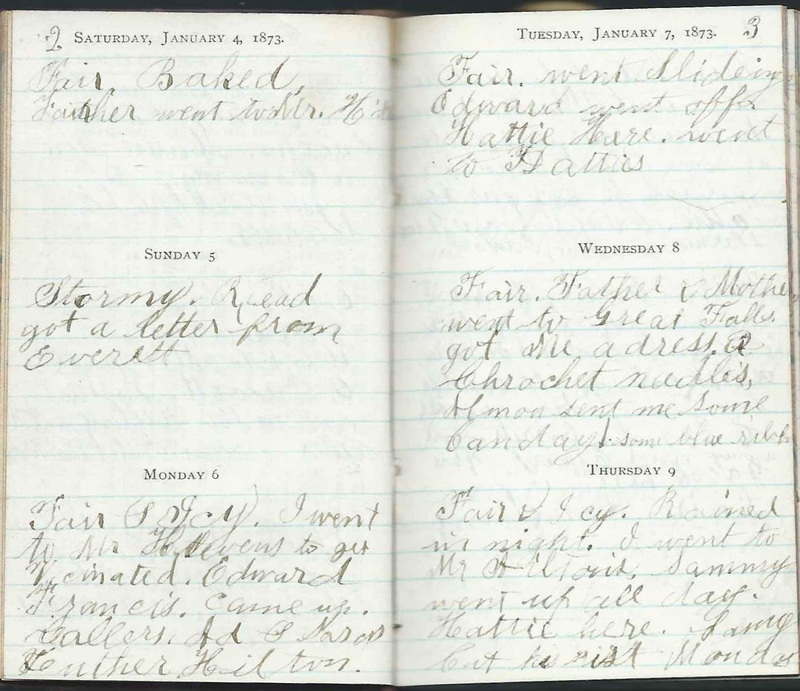 Saturday, January 11, 1873: Fair & Cold. Came home. For Christmas present from Aunt M., White Scarf and a bottle of Amaranth Cologne. Everett went away and Edward. Uncle Jacob here. Sunday, January 12, 1873: Fair. Read. 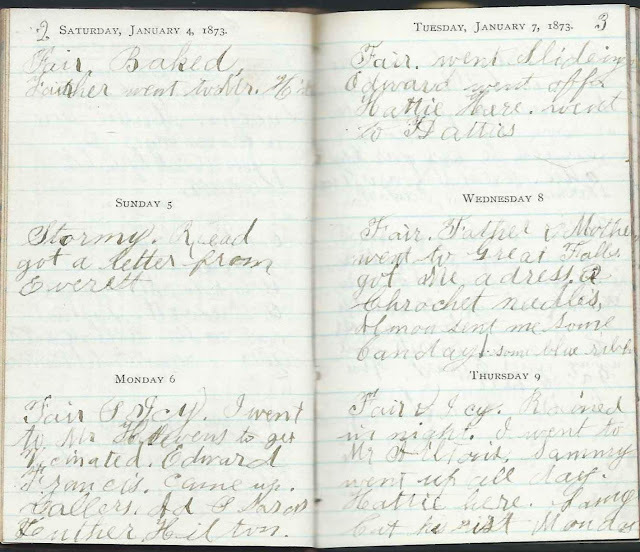 Monday, January 13, 1873: Dull. Snowed. Father went to Hanscombs, got two gallons of 70 cts molasses, 2 qts of kerosene at 11 [?] cts a qt. Churned, worked on Vests, G. H. here. Tuesday, January 14, 1873: Fair. Rained in night. Slid. Peddler here. Made 4 vests. Callers: Hattie, Sadie, Bell Prescott. Ida apparently mixed up her entries for January 15 and January 16. What appears next is what she intended to write for January 15, 1873. Thursday, January 16, 1873. This is for the 16. Rainy. Finished our 20 vests. got a letter today from Everett. Went to Tom's to get it. Baked a jonny Kake. 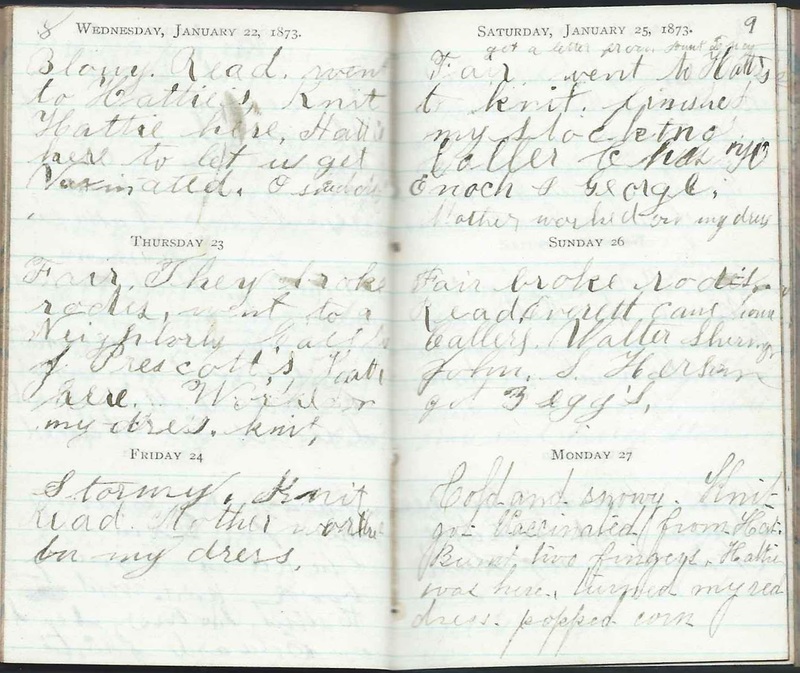 Friday, January 17, 1873: Dull and Rainy. Father went to Enoch's. Studied. Mother baked. Mrs. Phebe Cenney [Phoebe A. Hilton) Kenney) (1852-1873), wife of Dexter Kenney] Died about 9 o'clock. Took up my stockings. 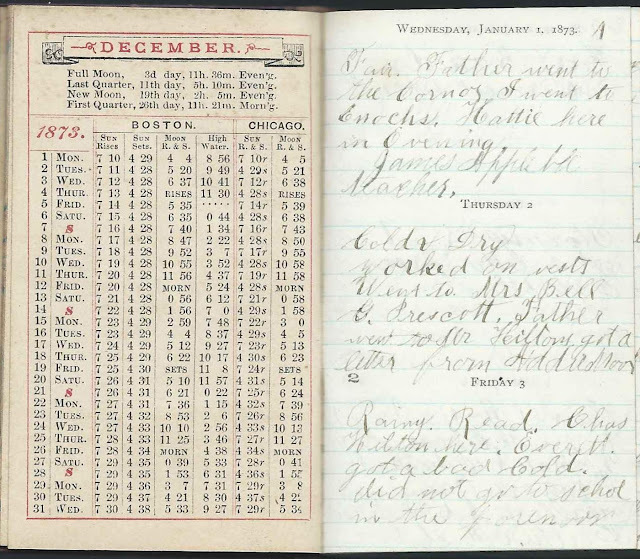 Saturday, January 18, 1873: Rainy. Mother Spun some. I Studied a little. Sunday, January 19, 1873: Fair. Went to Mr. Burrows to Funeral of Mrs. Cenney. Uncle Sawyer & Aunt Lucy came over. Went to George Prescott's Door. Hattie here. Monday, January 20, 1873: Fair in afternoon. Snowy. Uncle and Aunt went home. Father went to the Falls. Knit. ___[ Slid. I ?] and Hannah. Callers. Hattie, Jacob Stevens. We Washed. 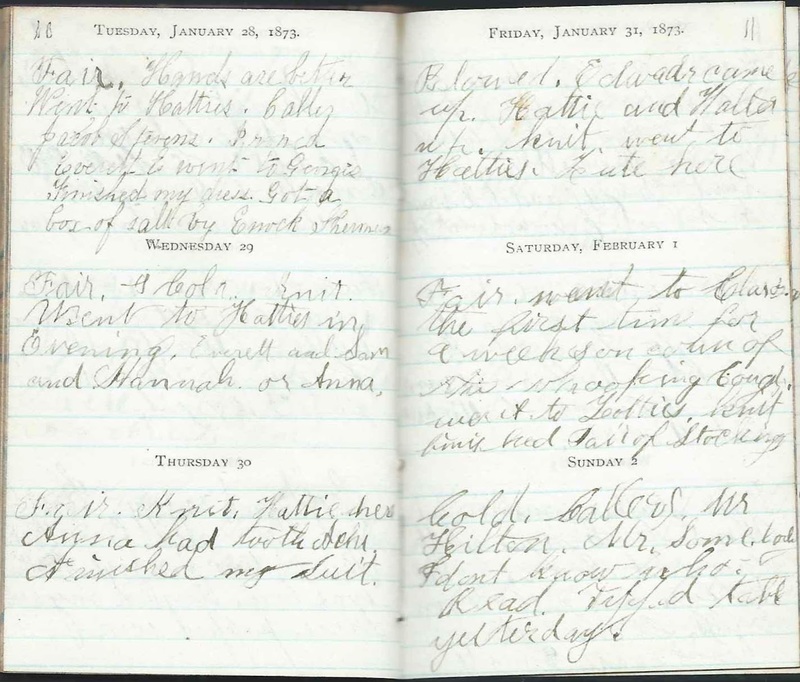 Tuesday, January 21, 1873: Snowy. Mr. Downes here for Dinner. Studied in Hymn Book. Knit. Went to Hattie's. Mother Sewed on Edward's shirts. Wednesday, January 22, 1873: Blowy. Read. Went to Hattie's. Knit. Hattie here. Hattie here to let us get vaccinated. I studied. Thursday, January 23, 1873: Fair. They broke roads, went to a neighborly Call to J. Prescott's. Hattie here. Worked on my dress. Knit. Friday, January 24, 1873: Stormy. Knit. Read. Mother worked on my dress. Saturday, January 25, 1873: Got a letter from Aunt Lucy. Fair. Went to Hattie's to knit. Finished my stocking. Callers: Charles H., Enoch & George. Mother worked on my dress. Sunday, January 26, 1873. Fair. Broke roads. Read. Everett came home. Callers: Walter Sherman, John S Hersom. Got 3 eggs. 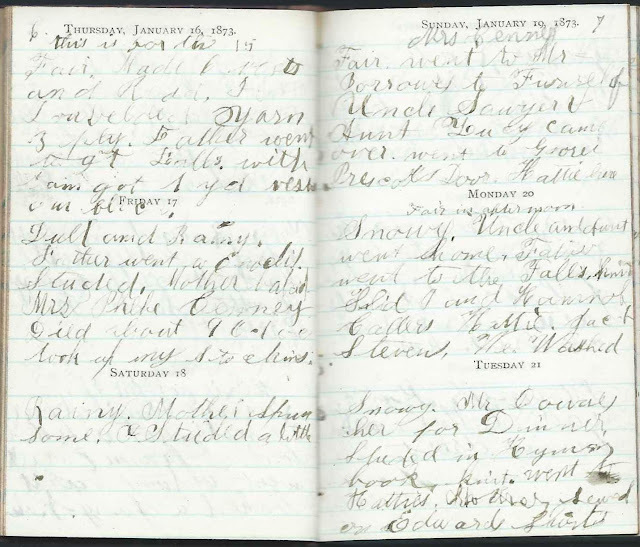 Monday, January 27, 1873: Cold and snowy. Knit. Got vaccinated from Hattie’s. Burnt two fingers. Hattie was here. ___ [hemmed ?] my red dress. Popped corn. Tuesday, January 28, 1873. Fair. Hands are better. Went to Hattie's. Caller: Jacob Stevens. Ironed. Everett went to [George's or Georgie's]. Finished my dress. Got a box of salt by Enoch Sherman. Wednesday, January 29, 1873: Fair and Cold. Knot. went to Hattie's in Evening. Everett and Sam and Hannah or Anna. Saturday, February 1, 1873: Fair. Went to Clara's the first time for a week on ___ [account ?] of the whooping cough. Went to Hattie's. Knit. Finished Pair of Stockings. 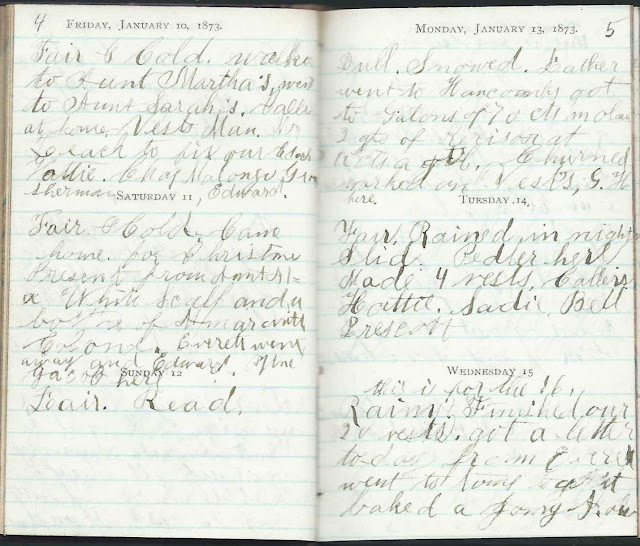 Sunday, February 2, 1873: Cold. Caller, Mr. Hilton. Mr. Somebody, I don't know who. Read. ___ [ ? table ?] yesterday. Enoch - presumably Enoch Piper Sherman (1836-1922), husband of Mary (Ricker) Sherman (1837-1889); his first wife, Jane (Guptill) Sherman, had died in 1861. Hattie - Ida's friend Harriet Eldora Sherman (1859-1937), "Hattie", daughter of Thomas Sherman (1823-1893) and Abigail Elizabeth (Fox) Sherman (1822-1877), "Abbie"
Mrs. Bell G. Prescott - Isabelle G. (Chamberlain) Prescott (1845-1923) wife of George Lockwood Prescott (1845-1883), "Lock"
Sammy - presumably Ida's maternal cousin Samuel Muir Francis ((1858-1928), son of Dr. Daniel Francis (1819-1867) and wife Christie Ann (Tupper) Francis (-1893) of Nova Scotia. Christie Ann (Tupper) Francis was a sister to Ida's mother Rachel E. (Tupper) Reynolds (1833-1923). Aunt Sarah - possibly Sarah A. (Patterson) Sherman (abt 1841, Edgecomb, Maine-? 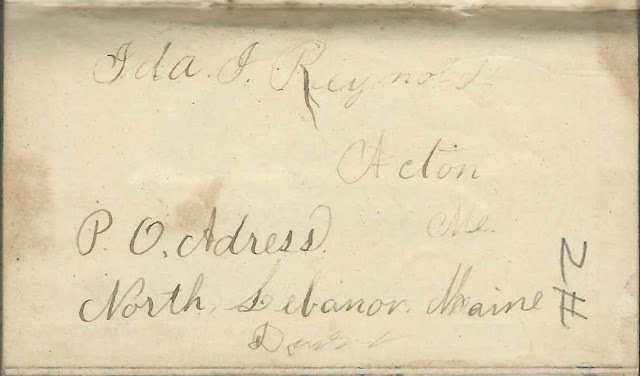 ), wife of John Wason Sherman (1838-1907) or ? Again, if you have any corrections, clarifications or additional information, please leave a comment or contact me directly.